Top ~scape dogs Pole and Barbara Preisinger round up ten forward thinking dubstep cuts on the label's latest comp Round Black Ghosts. Like Pole's RA.091 podcast for RA, Round Black Ghosts highlights the two merging scenes of dubstep and techno. Compiled from tracks selected by ~scape heads Pole and Barbara Preisinger, as well as Tim Tetzner, who runs Berlin record store Dense, the compilation includes tracks from emerging dubstep acts Martyn, Untold and 2562; cuts from dubstep label chiefs Pinch (Tectonic), Peverelist (Punch Drunk) and Ramadanman (Hessle Audio) as well as more contemporary dub from Pole and Dutch outfit Syncom Data. From day one, the pursuit of dub's influence on contemporary electronic music has been one of ~scape's guiding principles. 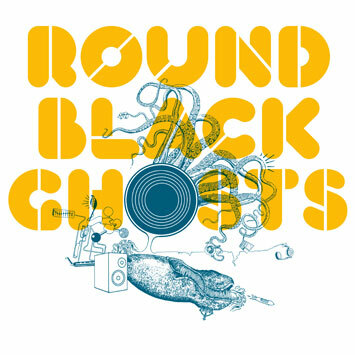 'ROUND BLACK GHOSTS' continues this tradition and, at the same time, adds a new facet to the mix. This CD, compiled by label owners STEFAN BETKE (Pole) and BARBARA PREISINGER together with TIM TETZNER (the heart and mind behind Berlin's DENSE Records shop), throws a spotlight on dubstep – a relatively recent genre, oscillating within and beyond its own fluid boundaries. Here, dubstep's ongoing process of redefinition and renegotiation finds itself further enriched and expanded by 'ROUND BLACK GHOSTS'. Originally a London phenomenon, dubstep pursues a different path from Berlin's trademark dub techno, a genre that has always played an important role in ~scape's varied sound research. Where dub techno borrows from the more traditional forms of dub and the corresponding mix techniques, dubstep not only lays claim to the – strongly dub and reggae-influenced – legacy of British rave culture, but also draws on various other styles without missing a step. Right now, it approaches one if its most exciting developments: a techno crossover. An entire generation of young dubstep producers have started to explore the genre, inventing some new, previously unheard sounds on the way. And this is where 'ROUND BLACK GHOSTS' comes into its own – with a concise overview of the latest developments, ready to take these new sounds to a wider, genre-encompassing audience. The title of the CD reflects the mysterious joy of fathoming the unknown. In these experiments, the artists on the compilation debug and recylce the aesthetics of techno. The playful merge of dubstep basslines that shake your bowels with the feedbacks of the echo chambers and elements of techno creates astonishing results. Nearly everything becomes acceptable and the black vinyl turns out once again to be the patron saint of these fusions. One might argue that each of the tracks is one of the 'ROUND BLACK GHOSTS'. Each having a new, self-contained aesthetics, it is at the same time coined by the "ghosts" of its musical predecessors. The results of this meeting of minds and styles are surprisingly varied. While MARTYN takes a detour to Detroit with his warm synth chords on 'Velvet', SYNCOM DATA's quietly pulsating 'Beyond The Stars' proudly pursues the paths of Berlin's dub techno legacy. ELEMENTAL, on the other hand, takes inspiration from the harsh sounds of IDM and Acid House. Yet despite their different approaches, the overall mix sounds impressively coherent. Beyond the genre's unifying and characteristic bass lines, all tracks leave plenty of room for deep delves into their own, private soundscapes. A quality that is cherished by all lovers and makers of dub, dubstep and techno. Martijn "MARTYN" Deykers, from the Dutch town of Eindhofen, started out as a drum&bass producer. Nowadays, his passion for soul and Detroit techno has found a new outlet in dubstep. 2562 is the pseudonym of Dave Huismans (Den Haag), whose recent releases on Tectonic caused a sizeable stir in the dubstep scene. Techno fans, on the other hand, might know him as A Made Up Sound, for broken beats he uses the alter ego Dogdaze. With his unconventional, detail-rich tracks UNTOLD is a prime example of dubstep's variety. Releases by the talented Londoner can be found on Hessle Audio and BOKA. ~scape founder and artist Stefan Betke aka POLE has played a major part in shaping the last decade of contemporary electronic dub. Dutch duo SYNCOM DATA are the compilation's only true techno fiends. Besides their productions, they also run their own label, SD Records. Otherwise known as David Kennedy, RAMADANMAN lives in Leeds and runs the Hessle Audio label. A pioneer of the Bristol scene, PINCH also set up and runs the influential dubstep labels Tectonic and Earwax. A dedicated champion of the latest dubstep/techno crossover, Tom Ford aka PEVERELIST not only runs Bristol's finest record shop, Rooted Records, but also his own label Punch Drunk. London-based producer ELEMENTAL draws inspiration from Techno, drum&bass and breakbeats. He is one of the few dubstep producers playing real live sets. Leeds-based producer PANGAEA is the latest addition to the city's thriving scene around the Hessle Audio label.